10 November 2014 | e-book Ed. The print edition was published on Monday, October 27th, 2014 in Chicago. It was distributed to select stores and mailed to select individuals. Friday, July 25th, 2014 in San Antonio, Texas. The Peeragogy Accelerator workshop at OpenEdJam. Saturday, February 1st, 2014 in Chicago. Incomplete History o' The U.P. le plaisir de la faire"
All staff and outsider work Copyright © the original author. Everything else Copyright © 2009, 2010, 2011, 2012, 2013, 2014 the Uncertainty Principle. All Rights Reserved Worldwide. 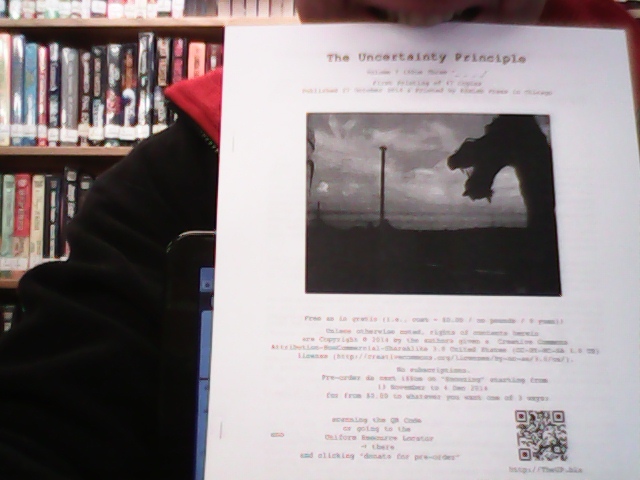 The print and digital editions of The Uncertainty Principle are serials published by #daLab Press, an imprint managed by Charlie Danoff. presented by The Sophisticates Society™ is a trademark (TM) of Charlie Danoff.